If Twitter user @chad_williams05 dies in a school shooting, he wants someone to tell his siblings he loves them. User @ianquick wants someone to put his body in the NRA parking lot. And @Faaabbbuloousss wants people to know she “wasn’t surprised” it happened. Since Sunday, tweets with the hashtag #IfIDieInASchoolShooting have flooded Twitter, as students’ fear, desperation, and anger over gun violence — the most recent case being Friday’s attack at a Santa Fe, Texas, high school — has once again reached a fever pitch. The hashtag had been tweeted nearly 50,000 times as of Monday, joining a string of viral school-shooting-linked hashtags such as #NeverAgain and #EnoughIsEnough, which gained traction following February’s Parkland, Florida, massacre. “All of these tweets are people’s futures; they’re people’s families that they want to have, things they want to do,” Schneidawind, a freshman at the University of Mary Washington in Virginia, told the 74. The notifications quickly started piling up — more than 1,500 retweets and 6,100 likes on his initial post, as of Tuesday — including from Parkland student activists such as Emma González, who responded, “#IfIDieInASchoolShooting I’d get to see Carmen again,” referencing one of the Parkland victims. #IfIDieInASchoolShooting plaster my face outside of every politician Who accepts money from the NRA’s office so every day as they walk into work they have to look into the eyes of someone who died because of their inaction and think of their own children or someone they know. 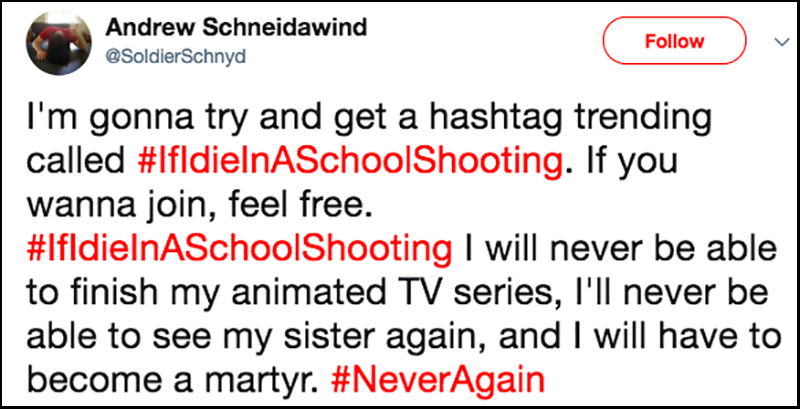 With the hashtag clearly striking a chord on social media, Schneidawind said he intends to physically send some of the tweets to legislators in the coming weeks. #IfIDieInASchoolShooting deliver my heart to dana loesch on a silver platter because she’s a heartless woman and clearly needs a new one. My projects wont be finished. My boyfriend will be all alone. My parents will have lost another kid. #IfIDieInASchoolShooting oh wait, “if” turned into “when” for me on 2/14. I wouldn’t have gone to prom or college. I wouldn’t have lived to be at my sisters wedding or become an aunt. I wouldn’t have lived to have kids. But I would have been just another number. This is America. Teacher here #IfIdieInASchoolShooting use my name in protest- for gun control and better school funding. Hopefully my death will have saved my students. #IfIDieInASchoolShooting I'll never get to grow up and look back at the person I used to be and think about how much I've grown. I'll never know what's like to not be just another sad teenaged girl. #IfIDieInASchoolShooting have the GOP put my casket in the ground so that they can let me down one last time. #IfIdieInASchoolShooting I wouldn’t have to worry about my future kids dying in one.